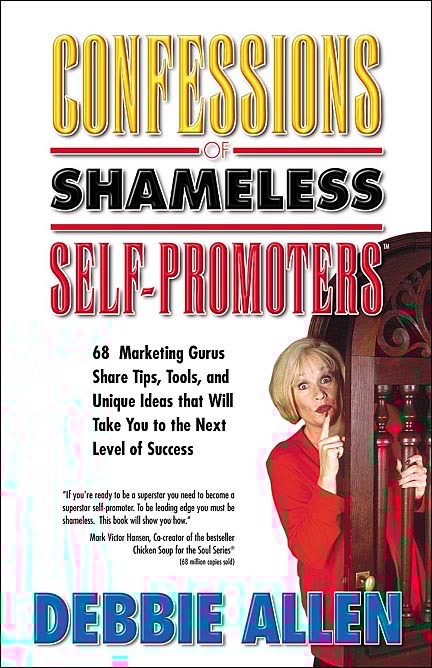 This article appears in the book, "Confessions of Shameless Self-Promoters" by Debbie Allen. Now available in Larry's Book Store in the Author & Speaker Section or click on the book cover to order. "I just finished reading "Self Promote Or Disappear" on your website. I found it extremely inspiring, and EXACTLY what I was looking for. Now, I can't wait to get started on promoting some of my ideas. Reading your article has lit a flame inside me. Thank you so much!" A Discourse on the Propriety of Puttin' on the Blitz! "When you are forgotten, you cease to exist!" in the TV special "Merlin"
There are several signs in my office that read, "Do something everyday to promote your books and yourself!" Why? Because as an author and speaker (or for that matter any business) is it far to easy to get wrapped up in all the stuff it takes to make my business work that I sometimes forget to promote, promote, promote. So, I give myself reminders. Why self-promote? To make sure everyone remembers you. Early in my career I discovered that if I was going to make it, I was the one who was in the best position to do the promotion. I believe in the value of my work in the relationship arena, know my topic better than anyone and as a result I made a decision to become a "do whatever it takes" kind of guy; a "shameless self-promoter." I even talk in elevators. The first rule of promotion is to talk about your work to anyone and everyone all the time. I do this by being curious and asking questions about what they do. Eventually the conversation shifts to what I do. You call attention to yourself by paying attention to others. If you don't feel comfortable in promoting your work, get over it! Shy people seldom make it to the top. Be assertive. Speak up. Make sure everyone knows what you do. Consistency is the key. I've tried just about everything. Some things work. Some don't. However if you think something won't work before you have tried it, you are certain to be right. I would rather be happy and promoting than right. . . so I will try anything that doesn't compromise my integrity and has worked for someone else. It's exciting to try new ways to promote yourself. It helps make life an adventure. Once my books were in the book stores I began a relentless campaign to market them. The marketing idea that has reaped the greatest benefit for me has been to appear as a guest on more than 450 radio talk shows. I will talk about my books and the benefits to the radio listeners to any radio host who will have me; large or small markets; for 5 minutes to a record 2 1/2 hour guest shot on a nationally syndicated radio show. I always send the host a "signed" copy of one of my books and an extra copy as a give-away. I get an extra plug that way. Many of my radio appearances come from my network of author/speakers who refer me to radio hosts. Create a good story with a hook that is informative and entertaining then get yourself booked on lots of talk shows. You have a better chance of getting the interview if you can create a link with what you do to a relevant topic or current event. Always remember, while you are there to promote your stuff, you must also provide entertaining content for the radio audience. Talk show hosts will seldom invite you back if you do not first have their audience in mind. In other words. . . be sure you have "something" of value to say (besides an occasional mention of your book). The preparation that is necessary for an interview is critical. Often the hosts will forget to promote your services. If this happens, I answer a question by saying, "As I said in my book, How to Really Love the One You're With, etc.," or "You can read more about his on my website, CelebrateLove.com, etc." Never answer a question by saying, "You'll have to read about that in my book," without giving the audience a taste of what is in the book. To tease without sharing makes it obvious that you value self-promotion above the listener's well being. More details about radio interviews can be found at: Radio Station Checklist. Accept speaking engagements to share helpful information and to promote your business. Afraid to speak in front of groups? Get over it! When you do the thing you fear the most, the death of fear is certain. Make your talk entertaining and informative. Take a speech class or join Toastmasters� to fine-tune your speaking skills. My friend, Larry Winget says, "If you have a speech, you have a book." Write a book! Network for ideas. It has been my experience that successful people are more willing to share their promotional secrets than unsuccessful people. You must ask for what you want. "Thank you for your article on self-promoting. I learned about 20 years too late that I needed to promote myself and my work. For some reason I had assumed all I had to do was write! Your service is going to be very useful for me. I have your site bookmarked." Some years ago I attended a National Speakers Association (NSA) meeting with the intention of finding a distributor for my three relationship books. At the first luncheon, best selling author, Gregory J.P. Godek "just happened" to be sitting at my table. Was that an accident? I think not. Notice I used the word "intention." Had there been no intention it is likely we would have never met. It is important to look for new promotional ideas with intention. When I asked if he could recommend a book distributor, he freely shared the name of his distributor and within five days I had a three year contract that put my books in the book stores nationally. Another example of asking for what you want came when I asked another NSA member if she would refer me to the producer of ABC TV's "The View." She had just completed a guest appearance. Although the thought of appearing on national TV was a little scary, I went all out to convince the producer that he should have me on the show in spite of the fact that he required a video. I didn't have a video. I made the cut and was interviewed for 14 minutes by Barbara Walters. Book sales skyrocketed! I shipped 200 signed books to the producer - one for everyone on staff and in the audience - and received an additional book mention. My picture with Barbara Walters on my website has also caught the attention of other producers. I'm also fascinated with and enjoy doing book signings. Granted they may often seem like a waste of time, however it is important to understand that the purpose of book signings is not necessarily to sell books, but to make the book store customers aware of your books. Another important point to understand is that books do not sell themselves! People SELL books! It is equally important to spend some of your time at your signing to smooze with the people who take the money from the customers who buy your books. Get to know the staff at the book store. They can help you continue to sell your books long after you have gone! Book signings are an opportunity to build relationships with the book sellers. I consider book signings as an opportunity to SELL the book sellers on recommending "my" books when someone asks for a good relationship book. My complete list of book signing tips can be found at: Book Signing Tips. If you have a product or service that could be sold nationally, the Internet is a great tool to use to expand your business. My website - with over 465 pages of information (as of 2/19/03) - is also one of my shameless marketing secrets. It is important to have your own domain name; one that tells about your business. I chose www.CelebrateLove.com. The strategy is to offer plenty of content to keep visitors coming back rather than have your site only be a commercial for your business. While there is plenty of information to remind my visitors about my work including relationship articles, a Q & A page and more, they can also find the latest weather, national news, technical news, an online shopping mall, book store and many more exciting ideas to keep them coming back. Initiating link trades with other similar websites is very important. Search engines often will list your site higher if you have lots of links to and from other websites. At this writing I have link exchange agreements with over 1,080 similar websites. Hits to my website are up significantly. Offering content (articles, etc.) with other sites will give you a greater presence on the Internet. Every piece of mail that leaves my office, including the bills that I pay, has a note, my business card and three four-color book marks in it - one for each book. If they can stuff my bill will promotional stuff, so can I. I have actually received book orders from the people who receive my checks to pay bills. Why not use this as an opportunity to promote your services. Fold a professional looking note around the check. In it request that they please forward it to their supervisor. The headline reads, "Do business with your customers. It just makes sense." Then I list the services I provide, an offer (call for action), my logo and contact information. Offer a "Business to Business" discount if they mention the offer when they call or e-mail. (Note: Thanks to BJ Hickman, www.BJHickman.com for the "note" tip!). I leave book marks everywhere. My website is listed on the back. Always, I repeat, always carry lots of business cards wherever you go. Never leave your office or your home without them. From time to time I receive offers for subscriptions and various other things. Regardless of whether I am interested in the product or service, if a self-addressed stamped envelope is enclosed, I stuff it with a note (with my logo), my bookmarks which feature my books and mail it on my next trip to the post office. The note says, "You were kind enough the send us your stuff. . . professional speaker, author and relationship coach, Larry James, invites you to check out his stuff at CelebrateLove.com, a site designed to help you fit the pieces of the relationship puzzle together in a healthy way." People can only contact you if you list all the ways they can contact you on your business card and all promotional pieces. Your name, address and all contact info should also be on every page of your website. Make it easy for people to find you. Every e-mail you send needs a signature; your name, address, phone, e-mail and website links and a one-liner that calls attention to your business. Write articles about your business and send them to magazines and online e-zines (online magazines), trade publications that serve your industry and share them other sites as free content in exchange for a link to your website. Always include a black and white picture and brief bio with contact info. Do everything you can to become known as the expert in your business. Write your own online newsletter with helpful information and always include a brief commercial with contact info. Send both online and offline news releases to the media anytime you do something special, even if you think it doesn't warrant their attention. My rule is: Let "them" make the decision. One such new release resulted in a paid speech to the association that served that media. Write letters to the editor. Attend meetings associated with your work or with the work of those you serve. Network. Read books, magazines and listen to audio cassettes about your business and how to promote it and yourself. Never forget your customers. If they like your services. . . ask them for referrals. . . then be sure to follow-up. I once labored for nearly two years building the ultimate Valentine for my wife; a heart-shaped water garden complete with waterfall and stream. Once completed I realized the value of talking about this to the media. A local TV station did a 7 minute piece about my work in the relationship area and used the water garden as a backdrop. I love self-promotion. I love the excitement of discovering a new idea that introduces more customers to my business. I enjoy brainstorming with others about ideas that have worked for them. Most great promotional ideas can be adapted to your business with a little creativity. Never pass up an opportunity to promote yourself and your business. If you stop promoting, your business will die a slow death. Never stop. Many years ago, one of my mentors, Sheldon Detrick, once told me that if you ever want to get anywhere in life, you must consistently "put something back!" By that, he meant that you must share what you know to help others; become involved in groups and organizations that give you the opportunity to share. I believed him and it has worked for me. Shel also taught me that you cannot help others, you can only help them help themselves. You can only share what you know with others and they must "do" something with the information. Use it or lose it. The most exciting part of being a shameless self-promoter is sharing my ideas with others. Never be afraid of competition. To me, it doesn't exist. There is plenty of business to go around. NOTE: The floating "CelebrateLove.com" banner text that follows your mouse on this page is another good example of shameless self-promotion! This article appears in the book, "Confessions of Shameless Self-Promoters" by Debbie Allen. Available in Larry's Book Store in the Author/Speaker Section. Here's another shameless self-promotion example of how Larry turned his Honda del Sol into the Scottsdale "LoveMobile". . .
Now Available! - "Confessions of Shameless Internet Promoters" by Debbie Allen. Buy it in Larry's Book Store in the Author & Speaker Section. Or. . . to read the chapter that Larry James wrote that is featured in the book, " The Buzz on Being a Shameless NetShaker!," click here. Write a review for CelebrateLove.com. Thanks! Buy special Halloween zip-lock baggies and with a couple pieces of candy, include your business card or a bookmark of your book. Buy some postcards with your picture and the cover of your book and under the picture print your name and "Local Author." On the back, print a brief bio, your website and book titles with ISBN #. Put a postcard in each child's Halloween candy bag.